How to Pass Style Me Girl Level 57, "Tiki Party," & Get 3 Stars Without Any Cash Items! | I Style Me Girl! How to Pass Style Me Girl Level 57, "Tiki Party," & Get 3 Stars Without Any Cash Items! Now, as I mentioned, the style I came up with in this example is very similar to an example I posted previously for the level, with a few modifications. Despite it being (seemingly) difficult to follow, (this I glean from comments of frustrated 'me girlers') I went with this style again because, well--it is the best successful method for earning three stars on the level without using cash items that I could come up with. It does earn three stars when adhered to, strictly adhered to. Exactly adhered to. And it does not contain any cash items, only free items that come with the game or silver coin items available in the Style Me Girl Boutique, but there are a few things that should be acknowledged. Again, in order to obtain three stars with this example, the example must be strictly, exactly adhered to. Omitting or changing any one item will very likely have a negative affect on the star rating result. Another thing I must point out, much to my dismay, I was unable to find hair or makeup items that were not a cash items, that reflected positively towards the overall score. In other words, hair and makeup totals are zero. They do not add to the score, but they do not fail the level either, so, they work. I really didn't like the zeros for hair and makeup on my scorecard, but try as I might, I could not find any hair or makeup that was not a cash item, that scored anything but. Zero marks and all, the goal of earning three stars without using cash items is still accomplished. The green bikini swimsuit, must be worn UNDER the dress! I point this out especially, because in my earlier post on this level, this fact was easily missed, since the bikini, being strapless, is not visible in the photograph or on the model. Hence, the bikini, a vital element of this three star example, was omitted, thus negating the resulting score, and star ratings of many that attempted this style. Don't forget the green bikini! Alrighty! Now that we've got those things understood, the items needed to earn 3 stars on Style Me Girl Level 57, "Tiki Party," in this example are pictured and described in the list below. The "Closet Items," screen capture image at right can be clicked to enlarge if you'd like a more detailed view. 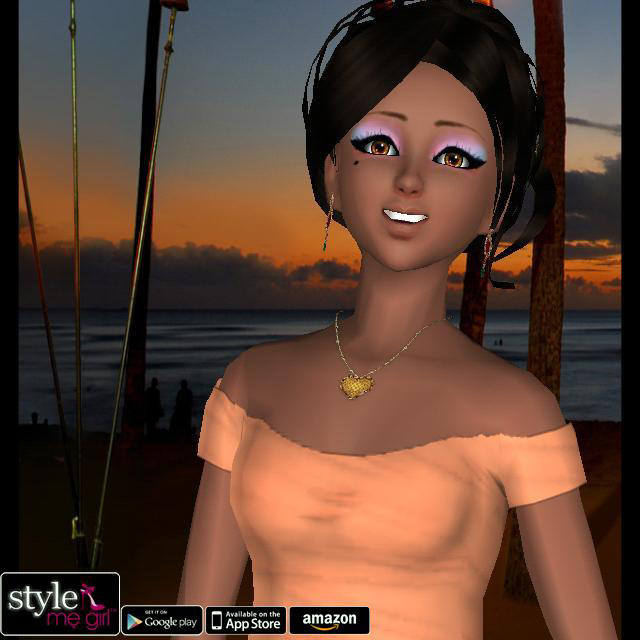 My three star stunning score for Style me Girl Level 57, "Tiki Party," with model Renee, can be seen in the screen capture shown left. Super easy 3 stars... Cheap no-brainer, really. MAKEUP: Dainty mascara, red lipstick, natural blush, purple and blue mascara with beauty mark. Gotta use your signature items more.